Lately I’ve been eating alot of steak. I don’t know why but it’s the mood I’m in and I’m not going to deny myself. On my way home from the gym I stopped to pick up some ingredients from the supermarket to make this sandwich, I had already decided on the arugula and goat cheese, but the surprise ingredient came into play when I got home. I have a bottle of El Dorado Rum that was brought from Guyana sitting on my kitchen counter for the past few weeks. While I was trying to figure out a marinade-dry or wet-that bottle of Rum caught my eye. I thought to myself “hmmm, steak with rum….haven’t seen that before, maybe I should try it”. The rum gives its a subtle, woodsy flavor…and don’t worry you won’t get drunk from this sandwich. I love the twist on an old classic. 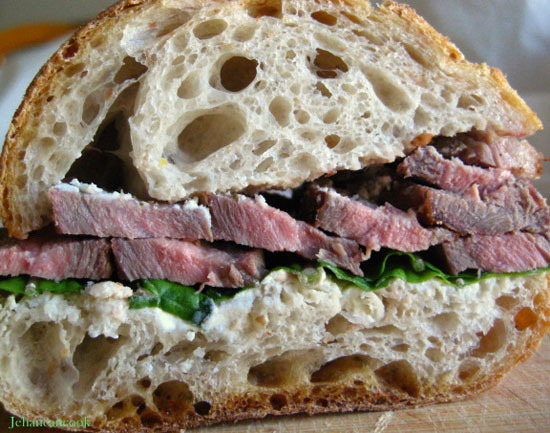 The crusty bread, creamy, tart goat cheese, peppery arugula and tender steak compliment each other very well. This would be a good “man sandwich”, very filling and meaty. Place rum, black pepper, salt, garlic and paprika in a ziplock bag. Place steak in bag and allow to marinate for at least 2 hours, turning occasionally. Remove steak from bag, and discard the marinade. Prepare grill. Place steak on grill, cook 5 mins per side ( you can adjust the cooking time depending on how you like you steak cooked). Remove steak from grill and allow to rest for 10 mins before slicing. Cutting diagonally against the grain cut steak into thin slices. Cut Bread in half lengthwise. Spread the goat cheese on both sides of the bread. 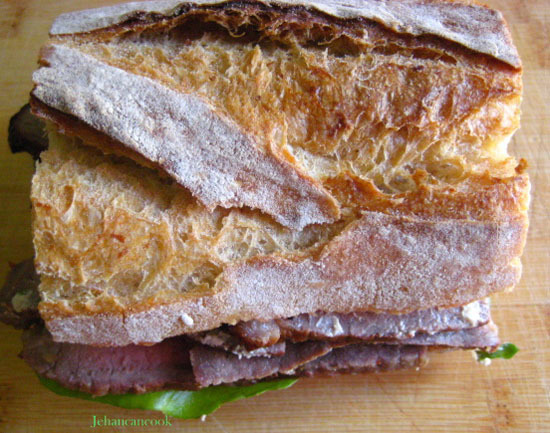 Cover one side of the bread with arugula, followed by the slices of steak . Cover with the other side of bread and cut to serve. Steak with rum sounds like a fantastic combination. What a great idea! When I see rum, I always think of rum punch and pink umbrellas, but I guess pink umbrellas wouldn’t fit with the “man sandwich” theme. That’s an awesome idea, marinating steak in rum! 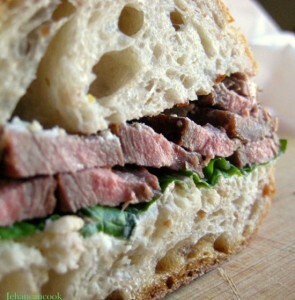 I love that I can see the thickness of the steak in your sandwich. This is so awesome. I am drooling! This was a great lunch for me. A goaty meal. I love being your royal Taster!